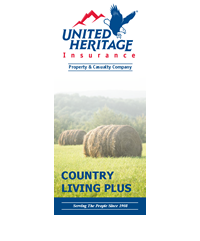 United Heritage Property & Casualty offers two Country Living products. The Country Living Plus and Country Living Plus II, are designed for owner occupied, hobby, Gentleman farms, or ranches. A claims free discount may be offered if the applicant has been claims free for 3 years. Our Country Living Plus product requires a dwelling to be 40 years or newer. However, the Country Living Plus II will allow dwellings built in 1960 or newer. Both products will allow manufactured homes 25 years or newer. All Country Living products allow acreage of 100 or less and no more than 25% of income can be derived from farming or ranching. 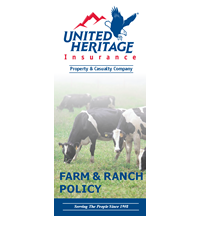 United Heritage Property & Casualty offers three types of Ponderosa products, they are designed for small to medium owner-occupied farming or ranching operations. The Ponderosa Plus product is designed for farm and ranch properties, which show pride of ownership and are well maintained. A claims free discount may be offered if the applicant has been claims free for 3 years. The home must be 40 years or newer and may be a manufactured home if 25 years or newer. The Ponderosa & Ponderosa II products are also designed for farm and ranch properties; however, 50 years and newer is allowed on the Ponderosa and there is no age limit on the Ponderosa II. Both products can have a manufactured home if 25 years or newer.